To Cite: Taskinlar H, Erdogan C, Yigit D, Ozgur A, Avlan D, et al. Dangerous Toys for Teenagers: Air Weapons, Trauma Mon. 2016 ; 21(4):e23360. doi: 10.5812/traumamon.23360. Introduction: Air weapons are used for sport, hunting, firearm training or just for fun, especially by teenagers, worldwide. These weapons are generally regarded as toys, and injuries from these weapons are thought to be harmless by users, parents and even officials. Improvements in weapons technology make the penetration power of these toys similar to conventional hand guns. To increase awareness about the serious injuries associated with these guns. Case Presentation: The medical records of four teenage boys shot by air weapons between January 2012 and January 2013 in Mersin, Turkey, were retrospectively reviewed in this study. Of the four boys, two needed prompt thoracic intervention due to pneumo/hemothorax, one needed urgent abdominal exploration due to pneumoperitoneum and bleeding from the spleen and one was treated conservatively. Conclusions: Air weapons can cause serious injuries among children. Increased public awareness, limitations to their usage and strict legislation are needed to protect children. 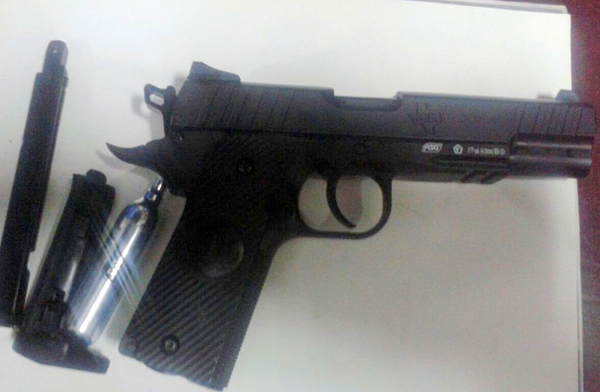 Air weapons or non-powder guns are weapons that use energy from compressed air or another gas to propel pellets, ball bearings, darts or arrows without a chemical reaction. They are used for sport, hunting, firearm training or just for fun in funfairs and paintball games worldwide. About 3.2 million air guns are sold and approximately 30,000 air gun–related injuries, mostly affecting children, are reported in the United States annually (1-3). Deficiency in legislation, low prices and effortless availability without a certificate, either directly or by internet order, make these guns very popular especially among teenage boys, who tend to spend more time outdoors doing strenuous activities (4). Unfortunately, air guns are not regarded as weapons. Injuries from these weapons are generally considered to be harmless by parents, officials and even physicians. However, new, sophisticated pellets and changing power technology that propels ammunition make these toys as dangerous as the missiles of conventional hand guns that have the power to penetrate skin, soft tissue and bones. Although the most commonly affected parts are soft tissue, eyes, the head and neck, air guns can cause severe injuries to the chest and abdomen, which can rapidly be fatal (5, 6). Here, we report on four teenagers, three of whom needed prompt thoracic or abdominal surgical intervention due to air gun injury, and focus on the current approach to the management of such injuries. A 10-year-old boy was admitted to the emergency department after being shot inadvertently by his friend at close range with an air rifle. On physical examination, he was hemodynamically stable. There was a 5 mm entrance wound in the right hemithorax at the medial aspect of the scapula. Palpable subcutaneous emphysema was extending from the entry site through the neck. Chest auscultation revealed reduced breath sounds in the right lung. 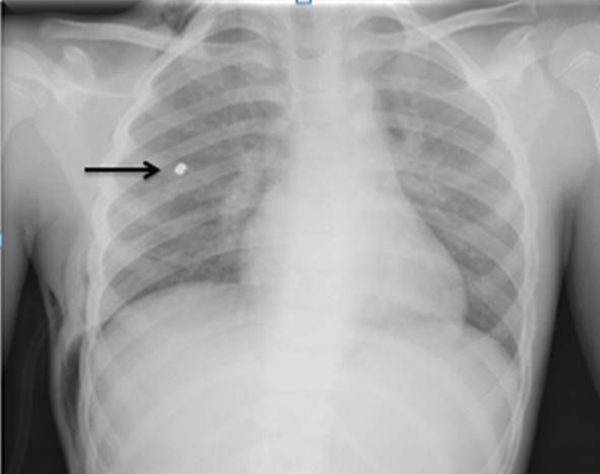 The chest x-ray showed a foreign body and pneumothorax in the right lung (Figure 1). Computed tomography (CT) revealed pneumothorax in the right hemithorax and subcutaneous emphysema in the right lateral wall of the thorax and the neck (Figure 2). A radiopaque foreign body was detected in the right lower lobe near the interlobar fissure. A tube thoracostomy and chest tube drain were performed and intravenous antibiotics initiated. The chest tube was removed after the disappearance of the pneumothorax on the postoperative third day and the boy discharged home in good condition. An 11-year-old boy was admitted to the emergency department after being shot with an air rifle accidently by his friend. On physical examination, he was good in general condition. There was a 4 mm entrance wound in the lateral wall of the left hemithorax at the level of the tenth rib. Chest auscultation was clear bilaterally. Abdominal palpation revealed tenderness in all quadrants. A thoracic and abdominal CT scan revealed a laceration in the upper pole of the spleen and free fluid around the spleen and in the abdomen. 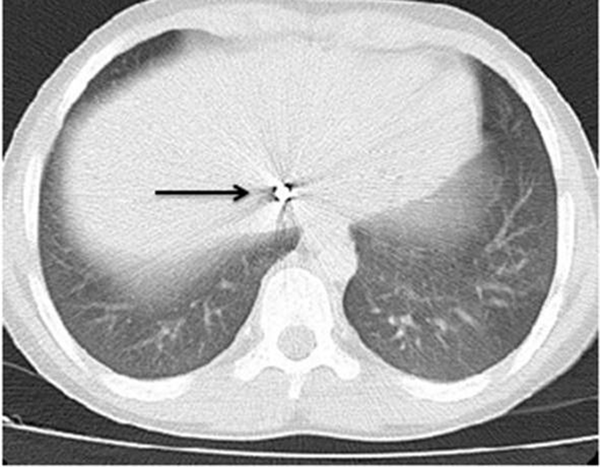 A radiopaque foreign body was detected between the right and left hepatic lobe junction (Figure 3). An urgent laparotomy and exploration were performed; a laceration from the upper pole of the spleen, a small laceration in the diaphragm and an entrance hole in the left lobe of liver were noticed. A splenectomy was performed due to uncontrolled bleeding. A laceration in the diaphragm was primarily repaired. A pellet was left in situ because there was no bleeding or bile leakage around the hepatic entrance. It was buried in the hepatic tissue and away from the main vasculature and ducts. The patient was treated with intravenous antibiotics and discharged on the postoperative seventh day in good condition. 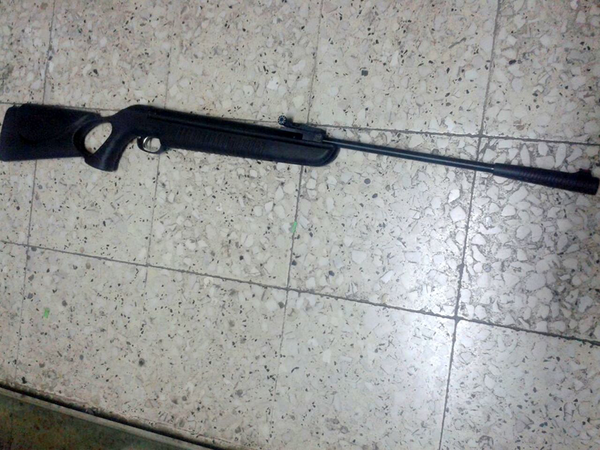 An 11-year-old boy was brought to the emergency department with complaints of pain after an unintentional air rifle injury. Chest auscultation revealed significantly reduced breath sounds in the left hemithorax. Diffuse palpable subcutaneous emphysema was noted in the anterior chest wall. There was a 4 mm entry wound in the localization of the left first intercostal space in the anterior axillary line. 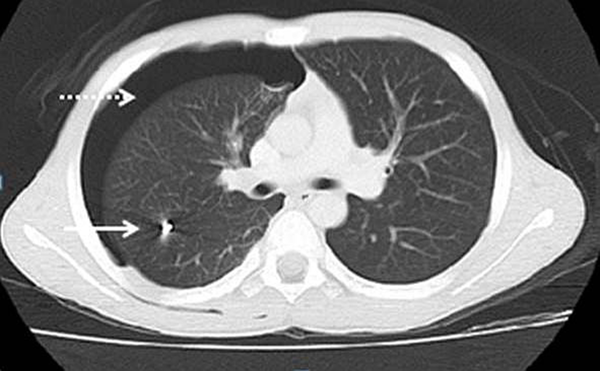 Thorax CT imaging revealed left pneumothorax and hemothorax and a radiopaque body on the back wall of the thorax (Figure 4). A tube thoracostomy and chest tube drain were performed, intravenous antibiotics started and hemodynamic parameters closely monitored. The chest tube was removed on the postoperative third day after the disappearance of the pneumothorax and the patient was discharge home in good condition. A 15-year-old male was shot accidently when another boy was trying to shoot balloon targets with an air rifle at a fun fair. On admission, his general condition was good and he was without any respiratory distress. His oxygen saturation was 100% in room air. There was a 4 mm entrance wound just below the right clavicle on the anterior wall of the right hemithorax, without any exit wound. Chest auscultation was bilaterally equal and clear. A chest X-ray showed a foreign body on the posterior aspect of the fourth rib. 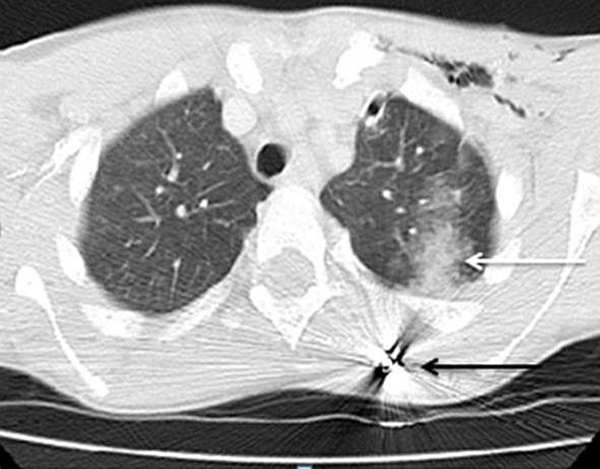 A thoracic CT scan revealed linear parenchyma damage in the upper pole of the right lung fitting with the trace of the pellet sitting in the posterior wall of the right hemithorax. Intravenous antibiotics were initiated, and the patient was closely monitored in the intensive care unit without any surgical intervention. He was discharged home in good condition on the fourth day of admission. Modern, powerful air weapons can cause severe disability or even death. Injuries from these weapons are underestimated, and the true incidence of these injuries is not known. These four cases within a year showed that increased injuries related to the spreading use of these weapons, especially by unsupervised teenage boys. In our cases, all four boys were shot by their friends with a spring piston type of air rifle at close range with pointed-type pellets. Two were shot when they were hunting birds, one while playing in his yard and one at a fun fair while another boy was trying to shoot balloon targets. Although homicides and suicides with air weapons are reported for adults, most reported air gun injuries are among teenage boys as a result of an accident by a friend or relative. McNeil et al. (2) reported nearly 33,000 cases of air gun injuries over a one-year period, and most of the victims were boys aged between 10 and 14, as in our cases. All our cases were shot by their friends unintentionally in the absence of adult supervision, fitting the demographics and conditions according to the literature. In the literature, particular attention has been paid to ocular, cranial, vascular, neck or chest air gun injuries due to their high morbidity and mortality. The basic approach to these kinds of injuries is to follow the main principles followed with other trauma patients: evaluate and stabilize the airway, breathing and circulation. Subcutaneous and intracranial pellets should be removed if easily accessible (7). Air weapon pellets are more prone to bacterial contamination due to their low temperatures, unlike powdered gun projectiles. Penetrating abdominal injuries require an urgent laparotomy and exploration. A laparotomy was needed for one of our patients with an abdominal air gun injury. A splenectomy due to a laceration and massive bleeding in the upper pole of the spleen and primary repair due to a superficial laceration on the diaphragm were performed. He was treated with intravenous antibiotics and discharged home in good condition. Thoracic air gun injuries may cause pneumothorax, hemothorax and vascular or cardiac injury, which can rapidly be fatal. Cardiac tamponade, major vascular or airway injuries hemorrhage more than 200 mL per hour from chest drain necessitate prompt thoracic exploration (8). Non-operative management has been suggested for asymptomatic, hemodynamically stable patients, but there is always a possibility for sudden deterioration and urgent intervention. One of our patients, who was hemodynamically stable and without pneumothorax and hemothorax, was treated with intravenous antibiotics and closely monitored for hemodynamically in the intensive care unit. In two of our patients, pellets damaged and lodged into the lung parenchyma and caused pneumothorax and hemothorax. The patients were managed with a tube thoracostomy, chest tube drain and intravenous antibiotics and closely monitored in the intensive care unit. A pellet seated close to a major blood vessel may undergo embolization (9). Antegrade arterial embolies should be removed as soon as possible, but retrograde venous embolies can be observed. Pellets in the lung parenchyma may be safely left in situ, but there is a risk of infection and abscess formation. Although one case in the literature points to lead intoxication, which was buried in the appendix, it is extremely rare. Luckily, our patients did not require further intervention. Air weapons work with the propulsive power of the sudden decompression of compressed air or another gas. There are three main different power sources for projection (10). The oldest and simplest power source is the spring-piston. The operator uses a lever for cocking the gun, and, after pulling the trigger, the decompression of the coiled spring creates compressed air just behind the ammunition that forces the pellet down the barrel. Spring-piston air weapons have a muzzle velocity of about 240 meters per second (m/s) for 0.177 caliber (cal) [4.5 mm] pellets (Figure 5). The second power source for air weapons is the gas spring. These guns are also called gas rams or gas struts. They use built-in pressurized air or nitrogen pistons in a chamber instead of mechanical springs. The muzzle velocity of these guns is between 120 - 200 m/s. The third power source is found in pneumatic air guns. These guns have onboard pumps to compress air with a single or multi-stroke. They can produce a muzzle velocity range of 60 - 380 m/s according to single or multi-pump action. Prefilled liquefied carbon dioxide cartridges are also used for generating power without mechanical power for cocking the gun (Figure 6). Technological improvements in the muzzle velocity/energy and new, sophisticated pellets have increased the penetration ability of ammunitions to the tissues, like other powdered guns (11). An experimental study of air weapons showed that a muzzle velocity range of 38 - 70 m/s is enough for the perforation of skin changing according to the caliber of the pellet (7). Air weapons sold in markets have muzzle velocities similar to those in popular conventional hand guns (Table 1). The penetration power depends not only on the muzzle velocity but also the weight or size of the pellet. 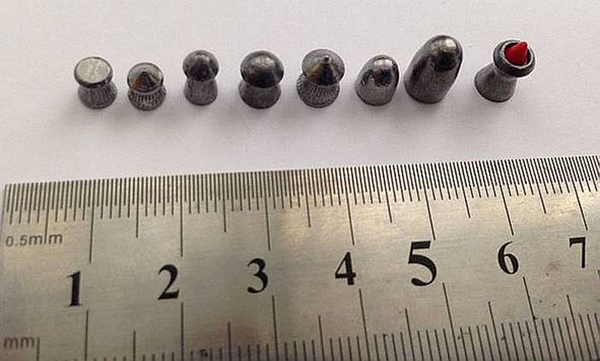 Pellets are usually made from lead, tin or brass and are of different shapes and sizes (Figure 7). The penetration power of these pellets can easily damage human skin and viscera or even break a bone at close range. Anyone can buy these guns/pellets without a license or market restriction. Most developed countries have gun control rules and legislation according to the bore, muzzle energy/velocity or ammunition of these non-powdered weapons. In the UK, air pistols that generate more than 8.1 joules (J) and air rifles that generate more than 16.2 J of kinetic energy are regarded as firearms, and they require possession of a Firearms Certificate. The online or mail-order sale of air guns is also prohibited. In the USA, some states define all non-powder guns as firearms, some define them as dangerous weapons and some impose age restrictions on possession. In Turkey, selling, buying or using air weapons without a license or document is allowed according to law number 2521. Therefore, anyone over 18 years of age can purchase these weapons, and anyone at any age can use these weapons without certification or adult supervision. Although air weapons are not regarded as guns in our laws, they can cause severe injuries or death to children. Preventing children from these injuries can be managed in our country, as in other developed countries, with the help of strict regulations and through raising the awareness of healthcare providers and the public about the hazards of these lethal “toys”. Air guns should be accepted as firearms, and more detailed legislation should be regulated, as in other developed countries. Authors’ Contribution: Study concept and design: Hakan Taskinlar, Anil Ozgur and Dincer Avlan; analysis and interpretation of data: Hakan Taskinlar, Cankat Erdogan and Dogakan Yigit; drafting of the manuscript: Hakan Taskinlar, Cankat Erdogan and Anil Ozgur; critical revision of the manuscript for important intellectual content: Dincer Avlan and Ali Nayci. Hakan Taskinlar developed the original idea and the protocol, abstracted and analyzed data, wrote the manuscript and is guarantor. Cankat Erdogan, Dogakan Yigit and Anil Ozgur contributed to the development of the protocol, abstracted data and prepared the manuscript. Dincer Avlan and Ali Nayci supervised the preparation of the manuscript.